In space vehicle control and fault recovery, how it works is that a big brother copy is on the ground and being fed with most recent data from spacecraft, the little brother. This ground one is an exact model plus extensive instrumentation that cannot be put into the spacecraft. Thus, the spacecraft does not need to run diagnostics and always sends them back to the big brother. Sending the most recent data has actually the minimum communication overhead because it's needed anyways. I want to know how they make the communication low-overhead, and how such protocols work. Is there any high-level documentation or scientific paper for that? Protocols for space communication are specified by the CCSDS: Consultative Committee for Space Data Systems. Founded in 1982, they "discuss and develop standards for space data and information systems". Your question cannot be answered in brief because getting into all of this will cover page after page here. I will simply say that probably everything you need to know can be found on their website, right here. Efficiency in communications affects all aspects of the communication system design. at the lowest level, you have the hardware: transmitter, receiver, antennas. Anything you do here influences the total system throughput: a bigger antenna or more powerful transmitter = more data can be sent. at higher levels, you have communications protocols like the turbo coding used by New Horizons. This makes sure you can send your message in as few bits as possible. the top level is the application: the actual science data and diagnostics/housekeeping information you're interested in. At the application level, a lot of research as been done into data compression. Typically, you want to send all data from the instruments to Earth (no compression), or you want to send enough that the original data can be reconstructed (lossless compression). by cropping images. 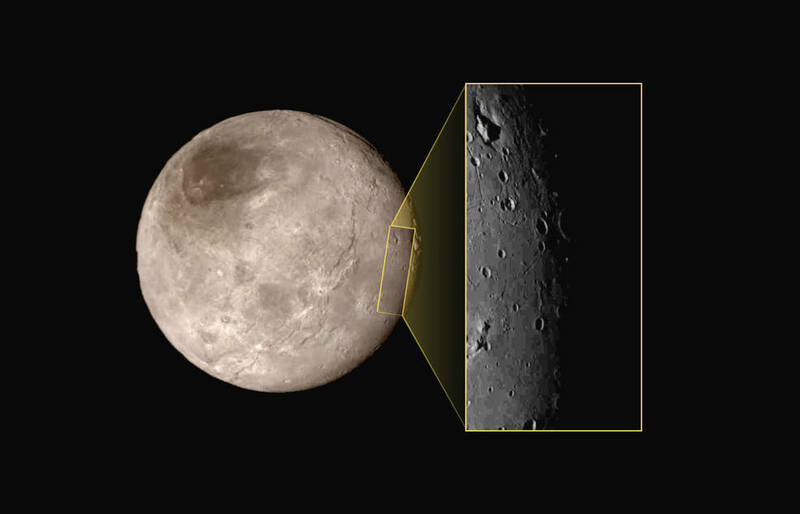 For instance, this image of a region of Charon is a rectangular cropped region. The remainder of the image (which would have shown empty space so it wasn't very interesting) was not sent at all. by compressing the image data using a lossy algorithm (JPEG, in this case). JPEG throws away data based on what the human eye can see: tiny differences are rounded off because they'd all look the same anyway. There is a risk in this: by throwing away data you reduce the scientific usefulness of the image. So New Horizons sends us compressed images now so we have at least something to look at, and will send the full, uncompressed data set over the next year and a half. Data compression will become more common. Some of the new space telescopes generate way more data than they can ever send to Earth, so the spacecraft has to contain powerful algorithms that help decide which images are interesting enough to send to Earth. Note: this answer focuses mostly on the science data as that will be bulk of the data volume. I haven't found good information on how housekeeping data is handled. Not the answer you're looking for? Browse other questions tagged nasa spacecraft communication voyager data-transmission or ask your own question. How did NASA remotely fix the code on the Mars Pathfinder? Current maximum bandwidth between Mars and Earth? What does the ISS Mission control center do? Was Houston able to control to the Apollo spacecraft if needed? CAPCOM Console at Mercury Control Center; what does Desired Retrofire Setting time display mean?